Christmas Tree Skirt - Free Pattern! 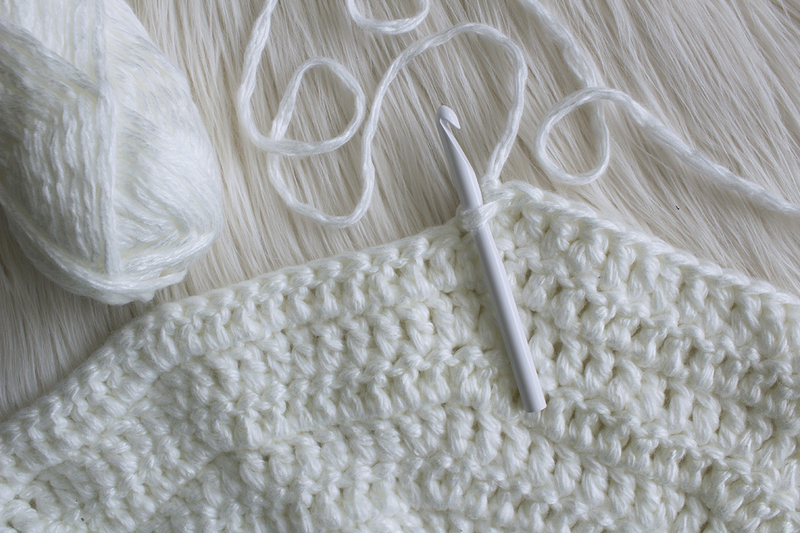 It’s that time of year again for chilly weather, hot cocoa, random acts of kindness and, of course, LOTS of cozy crochet time. Ever since I’ve known how to crochet, I’ve always wanted to make a tree skirt that our family could use each year with our Christmas tree! For whatever reason, I’ve never actually sat down and made one. Well, that time is over. I FINALLY MADE ONE AND I AM JUST SO IN LOVE! I hope you enjoy my Classic Tree Skirt crochet pattern as much as I do! 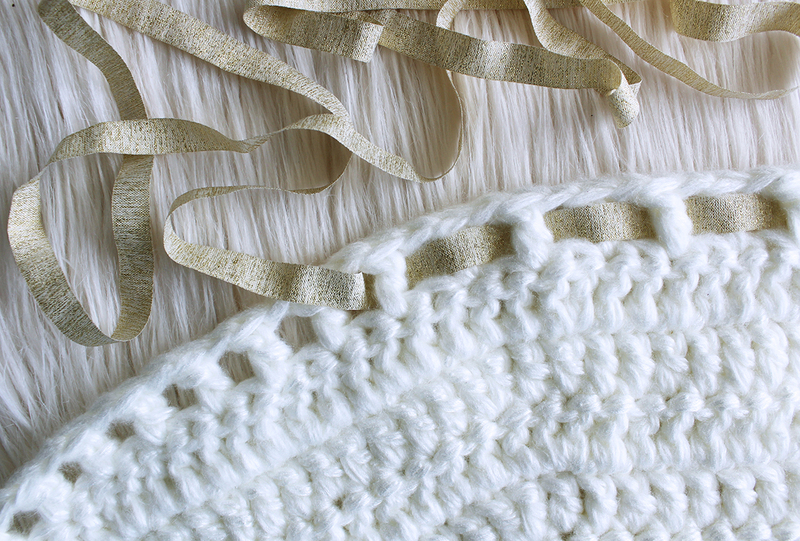 When I was at my local Jo-Ann Fabric & Crafts Stores to get the right materials for this project, I knew I wanted to use a beautiful white, bulky weight yarn. 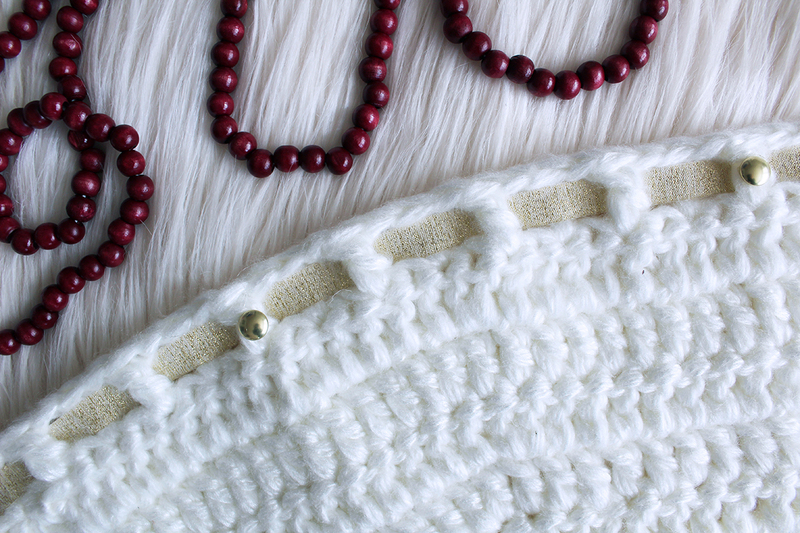 The stitch definition from bulky weight yarn is just so beautiful and it adds so much texture. I saw the Buttercream Glossy yarn (exclusively found only at JOANN stores) in white and instantly knew that was the PERFECT yarn for this. The beautiful and mild sheen is Christmas in yarn form, don’t you think?! I do hope you love this pattern! Be sure to post your progress as well as your final product on social media and use #handmadewithjoann to share your photo with our awesome community! I can’t wait to see everyone’s work! 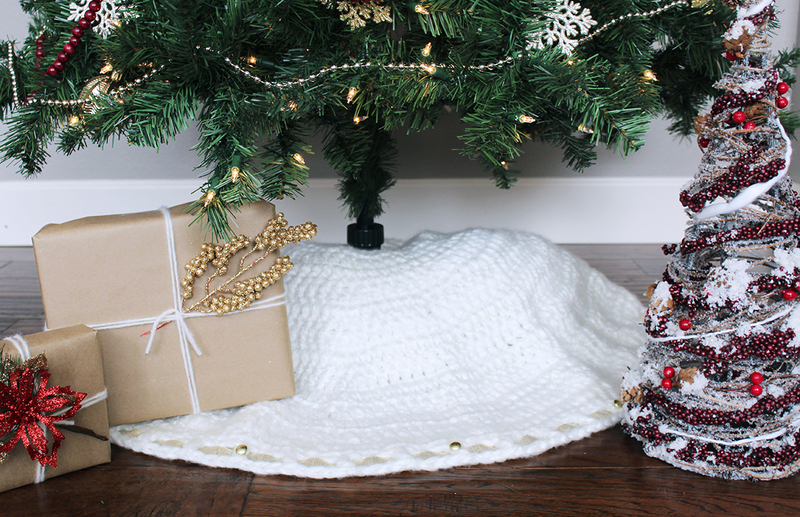 Once you've completed the crochet portion of your tree skirt, now is the time to decorate! I chose to use a 1” gold ribbon to weave through the spaces created in the last row. By simply dabbing a little bit of hot glue to secure the ends in place, this was an easy, quick but beautiful addition to my glossy tree skirt. I wanted to add one last detail to give it an extra texture, so I also used hot glue to adhere gold buttons I found at my local JOANN store intermittently. Between the gloss of the yarn, the classic double crochet stitch, elegant gold details… This is one tree skirt our family will definitely be able to use every holiday season. Now go make yours!